Hey all, just a quick post to urge you to head on over to https://grahamrpugh.com. I have moved this blog to GitHub and am using Jekyll and Disqus to automate the blog-like tools. This entry was posted in Uncategorized and tagged moved on December 10, 2015 by Graham. Munki-Do inherited from its father MunkiWebAdmin by Greg Neagle et al., the ability to commit to a Git-initiated Munki Repo when making changes to Munki manifests. Over the past few days I’ve been looking at how Git can interact with Munki. Using Git with Munki is covered in the Munki Wiki. It describes how to set up a git repository on a server with which you have CLI access. In my tests, I’ve been using a private repository on Bitbucket. I also started with an existing Munki repo, rather than setting up a new one. The pkgs folder was set to be ignored, as I didn’t want the large pkg/dmg/app files to be uploaded to the repo. This was done by editing /path/to/munki_repo/.gitignore and simply adding the line pkgs to the file. Version control is an essential tool in any Mac Administrator’s workflow. However, using Git with Munki has challenges due to the munki repository containing potentially very large packages, unsuitable for free cloud Git repositories such as Bitbucket, and challenging for paid private repositories on Github or elsewhere due to bandwidth issues. Even using your local organisation’s Git service could have bandwidth issues. A solution such as Git Fat could help with these issues, as the large files are dealt with separately. Alistair Banks describes an example Git Fat setup here. Git-LFS is another solution that could help. I intend to test these out and report in a future post. Bitbucket doesn’t respond to --author flags in git commit commands, so Munki-Do has been recoded to set the author variables based on the current user using git config user.name and git config user.email commands. 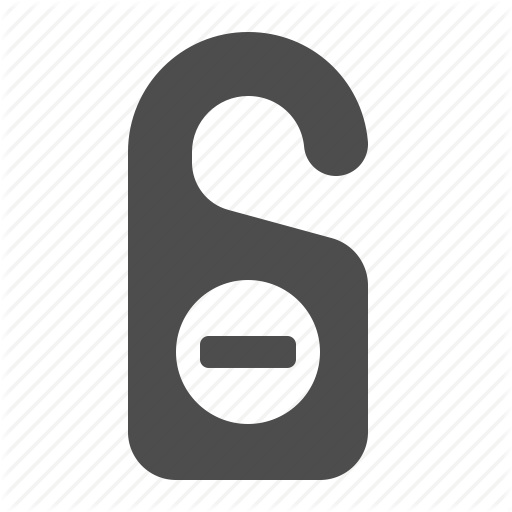 Since the Bitbucket repository is a private one, to enable automated interaction with the Bitbucket server, an ssh key needs to be generated on Munki-Do’s host, and the public key imported to the Bitbucket repo. The process for doing this is described here. Note that id_rsa must be first copied from ~/.ssh/ to the same folder as the Dockerfile. In my testing, sometimes the above ssh-keyscan command is not successful during docker build, in which case your git commits will fail. Take notice of the output of the build to ensure success! You can run the command again in a bash shell in the container if it fails during build. This entry was posted in Uncategorized and tagged munki, munkiwebadmin on October 15, 2015 by Graham. Disclaimer: Munki-Do is still a very much work in progress, so shouldn’t be used in production. I welcome the raising of issues, and pull requests. Munki-Do (as in “munki see, munki do”) enables the manipulation of Munki packages via the web. Munki-Do is based on MunkiWebAdmin (v1) from Greg Neagle, and was forked from Steve Kueng’s own forked version (https://github.com/SteveKueng/munkiwebadmin) – this version utilises a more recent version of Django, and has significant UI changes in comparison with the original MunkiWebAdmin. Manifests: create/delete manifests, and manage the contents of manifests. Catalogs: view the contents of catalogs, view pkginfo file contents in tabular form. The function to manipulate pkginfo files utilises munkitools (specifically, the makecatalogs command). This has been tested on an Ubuntu 14.04 VM, but you will need to ensure that your nginx user has write permissions to your munki repo. Use of group permissions is recommended. Greg Neagle announced at MacSysAdmins this week that he is working on MunkiWebAdmin2, which will allow full editing of pkginfo files including the catalog key. He also announced that MunkiWebAdmin2 will drop licensing and reporting tools, as with Munki-Do. I decided to put Munki-Do in production anyway, since I’d been working on it for a while, and as it may still provide the additional benefit of bulk changes to catalogs, and the ability to delete packages and pkginfo files to keep your repository from becoming too large and unwieldy. I welcome all feedback on whether this could become a useful tool in your workflow. I’ll revisit the tool once MunkiWebAdmin2 is released. This entry was posted in Uncategorized and tagged munki, munkiwebadmin on September 30, 2015 by Graham. A Mac user complained that Managed Software Center popped up in the middle of a conference presentation. I started looking into how to suppress notifications. As a quick fix, I created an AppleScript application which suppresses notifications for 24 hours, utilising the SuppressUserNotification key in /Library/Preferences/ManagedInstalls.plist. The application sets the key to TRUE, and runs a preflight script every time Munki runs on a client to check whether 24 hours have passed or not, after which it will reset the key back to FALSE. (See also my earlier post on getting MunkiWebAdmin to work with MunkiReport-PHP and/or Sal). You could permanently disable notifications, but that would mean users never become aware of updates, so some applications that require intervention such as closing blocking applications could get somewhat out of date. There is interest in the use of Apple’s Notification Centre for Managed Software Updates, but this is not yet considered reliable. If it becomes suitable, then Apple’s built in Do Not Disturb feature could be utilised. I’ll update this post if/when better solutions emerge. This entry was posted in munki and tagged munki on July 3, 2015 by Graham. Matlab is a cross-platform commercial programming tool. Its use is licensed, either with a personal license code or through a license server. It is made available as an ISO from the Mathworks website by authorised accounts. A silent installation method is detailed here. Previously I had installed Matlab on a Mac, and then imported the resulting App into Munki. For R2015a, I’ve written up the way I imported Matlab into Munki without having to install Matlab first. See https://github.com/grahampugh/osx-scripts/tree/master/matlab-munki for full details. This method involves packaging the installer ISO together with the license and configuration files into a DMG, and then using a postinstall_script in the Munki pkginfo file to mount the ISO and run the silent installer script. It should be noted that you need to have a different Name for each version of Matlab if you want them all to be separately available on the Managed Software Center, e.g. Matlab_R2014a, Matlab_R2015a etc. This entry was posted in Uncategorized on July 3, 2015 by Graham. I made a comment on the MacAdmins Slack #general board yesterday about my wish that the favourites list in the Go > “Connect to Server” list would share between devices using iCloud. This led scriptingosx to helpfully reply with a simple way of achieving this using Internet Shortcuts. I stumbled across another way of doing this by not reading the above blog properly. 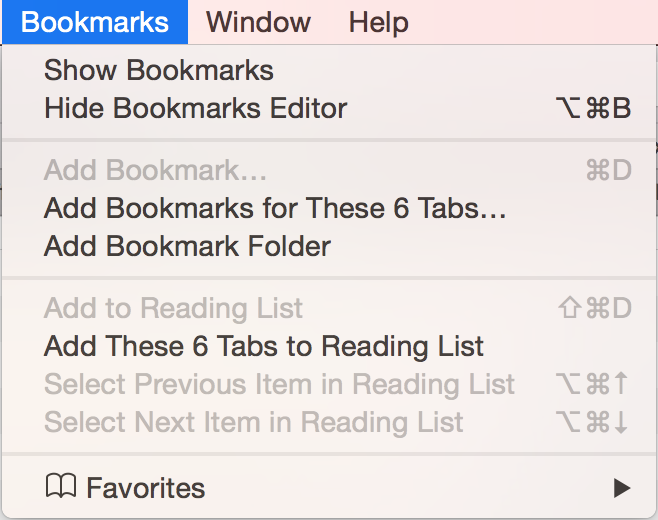 I decided to use Safari bookmarks rather than desktop shortcuts. These are automatically shared with iCloud as long as you tick the box for Safari sharing in your iCloud System Preferences. First, it would make sense to create a bookmark folder to house your favourite shortcuts. In Safari, click on Bookmarks > Add Bookmark folder. Then go to Bookmarks > Edit Bookmarks, and drag the new folder to move it if required (I put all my favourites in the “Favourites” folder as I use the Favourites bar). Now, open a new tab and go anywhere in the internet (it doesn’t matter where) and press Ctrl-D to add a bookmark. Select the new folder you just created and enter the Server URI address you wish to bookmark. As you’re likely to want to use these addresses on multiple computers, it may be worth adding the username to the field. Take a copy of the address with Ctrl-A Ctrl-C, as you’ll need it in the next step. Alternatively, you can just give the shortcut a descriptive name if you prefer. You’ll be adding the server address below anyway. Now, go back to the Edit Bookmarks tab, and select your entry. Double click on the URL address, and paste in your server URI address, replacing whatever you bookmarked. That’s it. Now you have a shortcut to your server in your Safari favourites, which are accessible from all your iCloud connected devices. (Sorry, most links won’t actually work on your iOS devices though!). As pointed out on the scriptingosx blog, these addresses can be any valid URI address format, such as ftp, ssh, vnc, smb, and afp addresses, and Microsoft Remote Desktop rdp addresses using the format described in this Microsoft Technet article, e.g. RDP links do work on your iOS device, as long as you have the Microsoft Remote Desktop app installed (although the domain doesn’t pass through, despite the Technet article stating that it is compatible with iOS). This entry was posted in Uncategorized on June 27, 2015 by Graham. 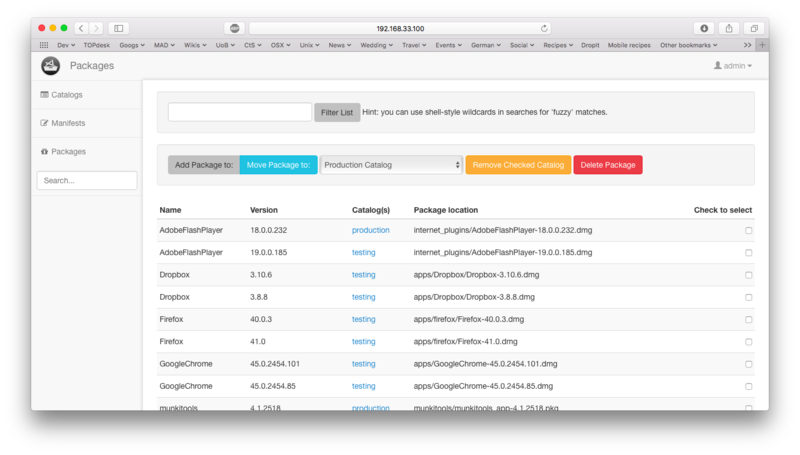 Munki-Enroll is a useful tool to use when installing the Munki tools on Mac clients. It enables the automated creation of unique client manifests, which makes it easy to change the group manifests of a client remotely at any time using tools like manifestutil, MunkiAdmin or MunkiWebAdmin, utilising the included_manifest key in Munki manifests. 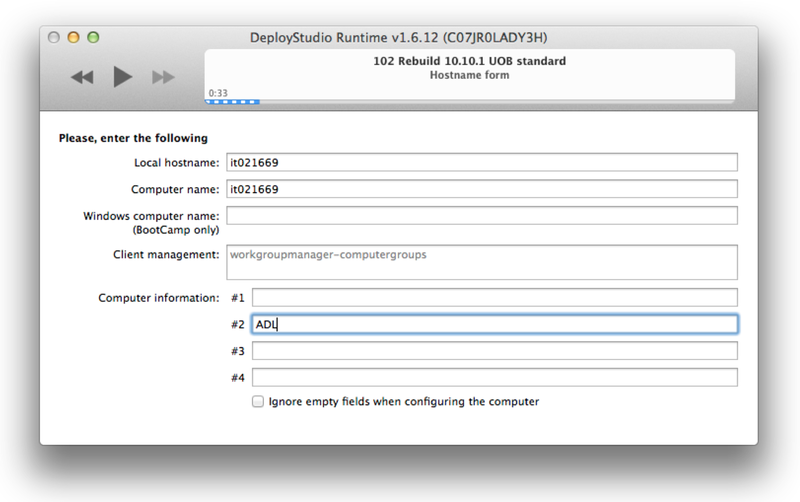 I have tweaked Munki-Enroll in order to leverage a feature of DeployStudio called Computer Information fields. These are four text fields available in the Hostname workflow page. sudo defaults write /Library/Preferences/com.apple.RemoteDesktop Text1 "Some text"
I’m not using the fourth Computer Information field at this time. Of course, your organisation’s manifests are very unlikely to be the same, but I hope this gives you an idea of the flexibility that can be gained using the Computer Information fields with Munki-Enroll. I also use the contents of Computer Information field 1 in my Munki AD-binding package to determine the Active Directory Organisational Unit. Note that this is a POST command – a change from the default munki-enroll which uses GET. This entry was posted in Uncategorized on June 13, 2015 by Graham.